Audi is crowning its successful A1 model series with an exclusive top-of-the-line model. The dynamic Audi A1 quattro, limited to just 333 units, moves to the head of the compact class. Its two-liter, turbocharged engine produces 188 kW (256 hp) and 350 Nm (258.15 lb-ft) of torque, which is delivered to all four wheels. The Audi A1 quattro sprints from zero to 100 km/h (62.14 mph) in 5.7 seconds and has a top speed of 245 km/h (152.24 mph). Audi is crowning its successful A1 model series with an exclusive top-of-the-line model. The dynamic A1 quattro, limited to just 333 units, moves to the head of the compact class. Its two-liter, turbocharged engine produces 188 kW (256 hp) and 350 Nm (258.15 lb-ft) of torque, which is delivered to all four wheels. 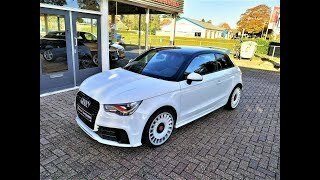 The Audi A1 quattro sprints from zero to 100 km/h (62.14 mph) in 5.7 seconds and has a top speed of 245 km/h (152.24 mph). The A1 quattro is powered by the 2.0 TFSI engine. The 1,984 cc, four-cylinder engine combines gasoline direct injection with turbocharging in the classic Audi manner. Among its highlights are the adjustable intake cam shaft and the two balance shafts, which ensure smooth operation. Maximum torque of 350 Nm (258.15 lb-ft) is continuously available between 2,500 and 4,500 rpm, and peak power (188 kW/256 hp) is developed at 6,000 rpm. Every detail of the sporty, sonorous four-cylinder engine has been optimized for high performance and low fuel consumption. Common rail injection, a turbocharger with intercooler and a regulated oil pump are just a few examples. The Audi A1 quattro is expected to consume on average 8.6 liters of fuel per 100km (27.67 US mpg). Yet it performs like a top-notch sports car: The standard sprint takes just 5.7 seconds, and top speed is 245 km/h (152.24 mph). The rear windows are tinted; the roof flows into a large, two-color wing. The color black accentuates the rear hatch and the diffuser. The LED rear lights are tinted; the rear bumper sports a distinctive look. The exhaust system terminates in two polished dual tailpipes on the left and the right, each measuring 100 millimeters (3.94 in) in diameter. The A1 quattro is 3,987 millimeters (13.08 ft) long, 1,740 millimeters (5.71 ft) wide and 1,416 millimeters (4.65 ft) tall, making it somewhat longer than the model on which it is based. Luggage capacity is 210 liters (7.42 cu ft); folding down the rear seats increases this to 860 liters (30.37 cu ft).